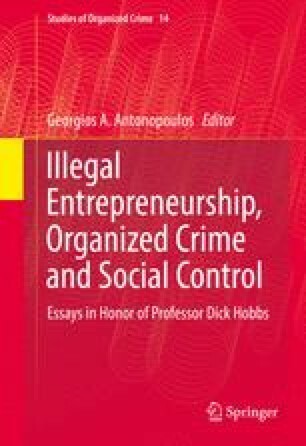 The chapter analyzes the central role of biker groups in the process of defining and making sense of the concept of organized crime (OC) in Norway. Bikers served as “suitable enemies” in this process, initially in 1992 when Rowdies in Trondheim became a chapter of Hells Angels and later in 2011 when “1 % clubs” got re-labeled as “criminal 1 % clubs” and highlighted as among the most serious organized crime groups. Bergensavisen. (2013). Her sitter politiet og Hells Angels side om side. Bergensavisen. October 1. Retrieved from http://www.ba.no/nyheter/her-sitter-politiet-og-hells-angels-side-om-side/s/1-41-6894514.